While we've been hoping for a drum battle between Twenty One Pilots' Josh Dun and our favorite 8-year-old drummer Milana Rocks, Dun decided to take a new challenge—himself. Check out this unique encounter below! 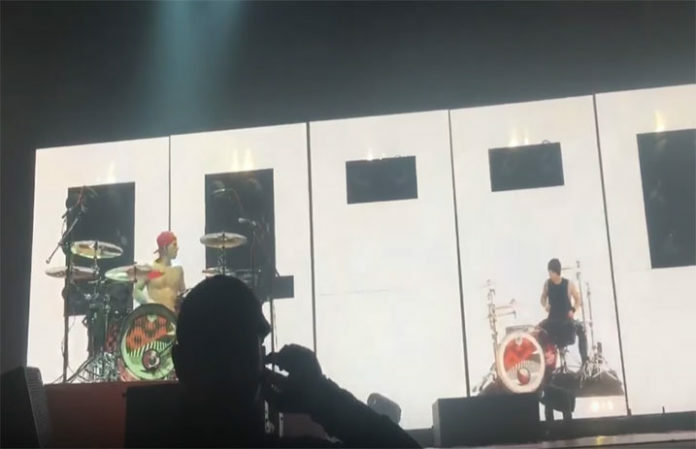 The encounter happened at a Twenty One Pilots show in Providence, RI and fans are already beginning to speculate what this drum battle might mean. One aspect of the battle that has really had fans talking is the end where “fake” Josh Dun's head explodes. Some fans are speculating that this represents Dun defeating his Blurryface. This would explain why his Twitter name has been changed from spooky jim to Josh Dun.